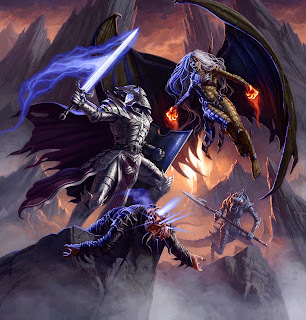 A little discussion of iconic imagery and it's history in Dungeons and Dragons. 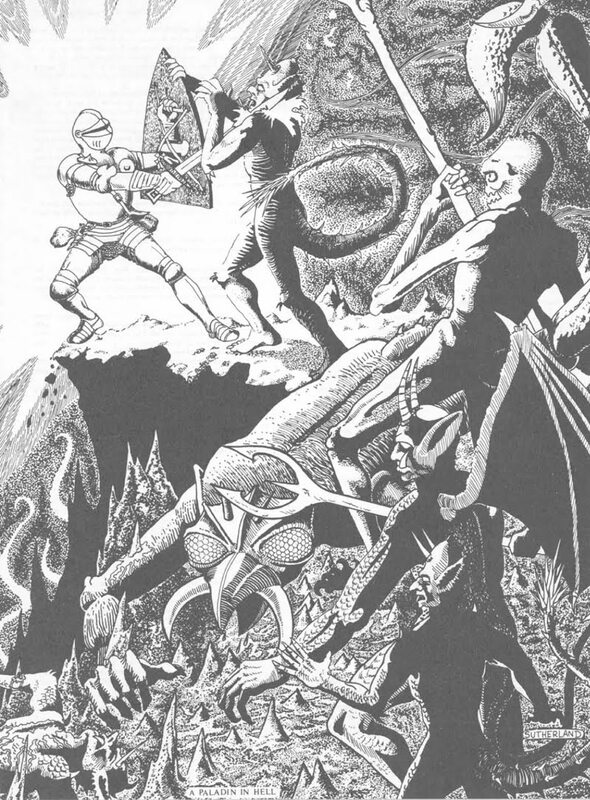 When I was a youth, my father took me to the mall to pick up his own personal copy of the 1st edition Advanced Dungeons & Dragons Players Handbook by Gary Gygax. He was in a gaming group and was buying one for himself. I don't remember him purchasing it from Waldenbooks, but afterwords we walked a little way and sat down in the pizzeria and sat down to look at it. I'm sure I asked a lot of questions that day, but I have one clear memory that stands out among all others. It still resonates with me to this day. Click it to appreciate it. The thought of that faceless man, entering a Bosch-like hell, surrounded by a blinding aura of good is haunting. Alone, with courage he takes on inhuman monstrosities. It spoke to me of adventure and sacrifice. To this day paladin is one of my favorite classes. 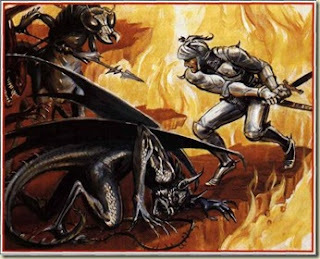 One of the wonderful things about the OSR are the large number of homages to classic art. Here are a few of the best. Homages are nothing new, here's a second edition homage by Fred Fields, with an entire accompanying module. 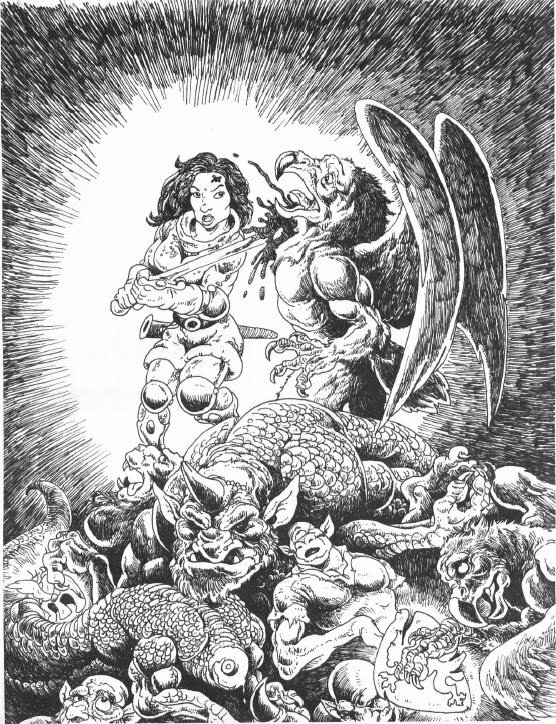 The module is written by Monte Cook and has an old school deadliness. It even features Emirikol the Chaotic! 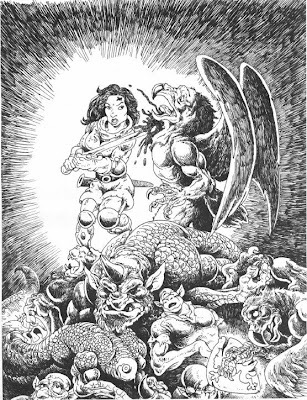 A Paladin in Hell, 1988 Fred Fields, 13"x15-1/2"
An unknown piece from a book I do not have. Appears to be a color homage. Here is the Homage from the Fiendish Codex II by Carl Frank. Here is an Unintentional Homage by Craig J. Spearing. And before we leave, Daddy Grognard did some number crunching on this piece. His Saturday Night Fight Club link is worth a read if you're curious how the paladin does. Thanks for the link! That was a long time ago but it's nice to see it's still getting the mentions. My favourite iteration is still the 1e one but now you've got me thinking "If only Trampier had done a version!" I've looked at that PHB dozens of times, stared at it for long minutes. I never noticed the aura good. I share your feelings on this art. Courage and sacrifice. 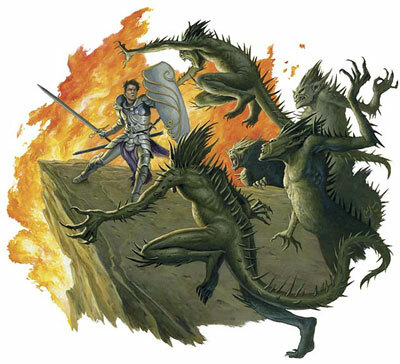 This image is the paladin in a nutshell. The willingness to walk into the proverbial valley of the shadow of death. To live that, to own that. If you aren't willing to put yourself there -- surrounded by evil, on the brink of fire and death -- then don't sign up. That man is *duty-bound,* folks.